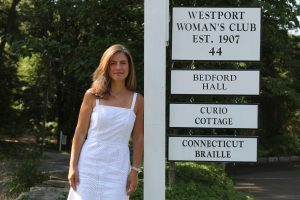 The Westport Woman’s Club welcomes Christina McVaney as its new President as the Club enters its 112th year of service, fundraising and philanthropy. A Westport resident since 2007, Christina places great importance on giving back to her community. She has served the WWC as co-chair of several fundraisers, including the club’s largest fundraiser, The Yankee Doodle Fair, for the past five years. While balancing her career as a residential realtor, Christina has consistently carved personal time for her commitment to volunteerism. Christina is a current board member for “Neighbors and Newcomers of Westport” and was an active PTA parent while her three children attended Westport Public Schools. As WWC president, Christina’s schedule will include overseeing Westport Woman’s Club operating budgets, annual grant awards, need-based scholarship awards, food closet collaboration with the town’s Human Services Department, board meetings, social gatherings, holiday giving, and club fundraisers throughout the year. Born in Michigan, Christina spent most of her childhood in Beirut, Lebanon before returning to Michigan for high school, and then graduating from the University of Michigan. She speaks French, Arabic, and Spanish and had lived in Illinois, California and Massachusetts before arriving in Connecticut with her husband, Keith, and their family. They enjoy hiking, movies, and traveling together as a family. “I’m happy and proud to take on the position of President of the Westport Woman’s Club. My mother and grandmother were both involved in Woman’s Clubs in Michigan and I’m looking forward to continuing that family tradition of community involvement and philanthropy. I hope that over the next two years I will continue the great work of past presidents and I’m eager to introduce innovations and new ideas of my own,” Christina McVaney said. Join Christina and The Westport Woman’s Club to make a difference in the lives of others this year; Westport residency is not required. On Wednesday, September 26th, 5:30 pm – 7:30 pm, women of all ages, interested in learning more about the WWC, are invited to a Wine and Cheese Prospective Member Mixer at our historic Clubhouse (44 Imperial Avenue, Westport, CT). Prospective members wishing to learn more about membership or to have a tour of our Clubhouse may also contact Membership Director, Robin Clark, at rclark@westportnational.com, or the WWC Office at 203-227-4240, to register.